Your order will ship MONDAY if placed in the next 20 hours 57 minutes . Enter your shipping address zip code to receive an instant delivery date estimate from UPS. Perfecta 223 Remington Ammo 55 Grain FMJ for sale online at cheap discount price with free shipping available on bulk ammo order only at our online store TargetSportsUSA.com. Target Sports USA has the entire line of Perfecta ammunition for sale including this 223 Remington 55 Grain FMJ bullet ammo. Perfecta 223 Remington 55 Grain FMJ ammo review offers the following information: Perfecta ammunition made by Fiocchi Ammo in Italy features brass casing ammo, non corrosive primer and reloadable cases. Perfecta ammo is brand new production ammo, not reloaded and features high quality components that will deliver consistency and reliability. 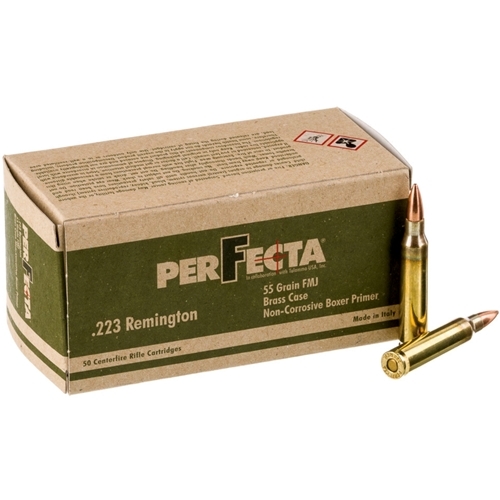 Perfecta 223 Remington ammo is used for target and practice shooting and features a lead core 55 Grain Full Metal Jacket bullet that is Non-Magnetic, therefore save to use in indoor shooting ranges as well. Perfecta ammunition was developed by Fiocchi in Italy with meticulously selected components assembled in a dedicated precision loading department to guarantee consistent high performance. The brass case, bullet and non-corrosive primers are selected and balanced according to each powder lot ensuring each round is precisely crafted for the ultimate accuracy and downrange performance. Perfecta 223 Remington Ammunition's brass is way to soft. powder is dirty. My rifle does not cycle because the case where primer pocket. Expands into the chamber wall. Perfecta Ammo for sale online at cheap discount price with free shipping available only at our online store Target Sports USA.com. 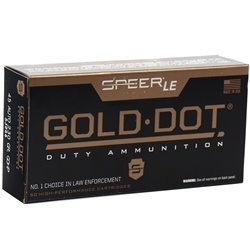 Target Sports USA has the entire line of Perfecta ammo for sale online including the most popular ammunition calibers such as Perfecta 9mm ammo, Perfecta 223 Remington ammo, Perfecta 45 ACP AUTO ammo, Perfecta 308 Winchester ammo, Perfecta 38 Special Ammo, Perfecta 357 Magnum ammo and many others. PerFecta ammunition was developed by Fiocchi in Italy with meticulously selected components assembled in a dedicated precision loading department to guarantee consistent high performance ammuntiion. The brass case, bullet, and non-corrosive primers are selected and balanced according to each powder lot ensuring each round is precisely crafted for the ultimate in accuracy and downrange performance. Fiocchi Ammunition is one of the largest ammunition manufactures un Europe, Italy delivering high quality small arms ammunition to the United States civilian market.